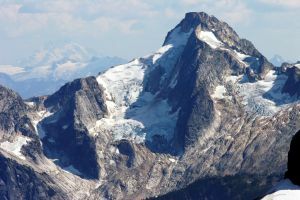 This peak is #26 in Prominence List for Washington .Mount Blum is the largest mass of mountain between the Picket Range, Mount Shuksan, and Whitehorse Mountain. It's a rugged, remote peak that is rarely climbed due to approach difficulties. Mount Blum has a large and distinct north ridge. The standard summit route is the via the west slopes, mostly bush and scree.